Cleome gynandra, commonly known as “Spider Flower,” “Spiderwisp” or “Cat’s Whiskers,” is an erect annual indigenous to Africa. 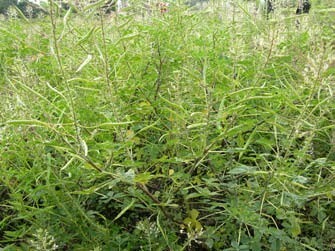 Though it occurs as a weed or “volunteer crop” in many parts of the tropics, in countries such as Tanzania, spider flower is cultivated in household gardens as a valuable potherb or for animal fodder. Seed from spider flower can be broadcast at planting. After germination, seedlings can be thinned, cooked and eaten as a vegetable. (For more controlled production, AVRDC [the World Vegetable Center] recommends a 25 x 70 cm, double-row planting.) Remove flowers as they form to induce continued leaf and shoot production for an extended harvest. After numerous harvests, allow the plants to flower and set seed. The seed can then be left on the plants and allowed to reseed for the next growing season, or harvested and pressed for oil or broadcast for the next crop season. Figure 2: Spider flower plant at AVRDC-Regional Center for Africa. Photo by Tim Motis. Leaves, young stems and flowers are edible and contain substantial amounts of vitamins A and C (which diminish with processing), iron and calcium. Spider flower is often eaten along with other foods, due to its bitter taste. The leaves can be boiled or fermented and eaten; they can also be blanched, dried and stored (for up to 6 months), then reconstituted later with cooking. Note that spider flower contains hydrocyanic acid, which is removed with cooking (ideally for 15 minutes), drying or fermenting. The seeds of spider flower contain oil that can be extracted and used for food and medicinal purposes. Spider flower is considered a medicinal plant. Its leaves can be dried and used to make a tea that prevents scurvy; fresh leaves are often used to supplement diets of pregnant and lactating women; and the roots are used to treat fevers, scorpion stings and arthritis. The plant naturally repels insects. Spider flower can grow under many conditions, but prefers full sun and median moisture conditions (though it prefers drier rather than waterlogged soils). Where the plant is indigenous, seed is easy to collect (for botanical descriptions to aid in identification, see http://pdf.usaid.gov/pdf_docs/PNACH878.pdf). ECHO can also provide a trial packet of seed to interested network members. We would like to know how the seed we carry compares in performance with indigenous populations, so please send feedback on your trials.